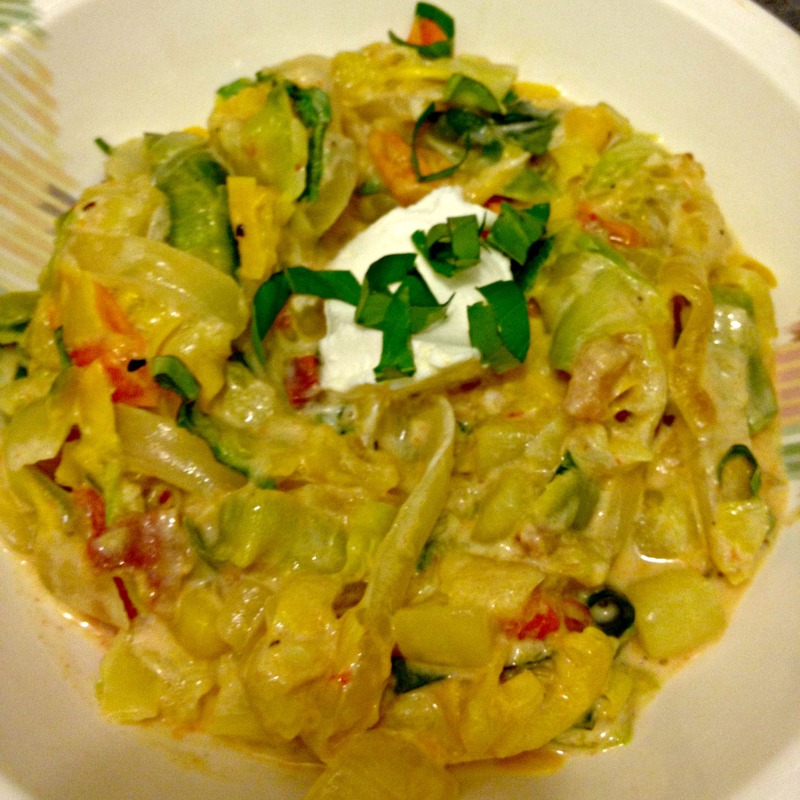 Last night I made one of my absolute favorite meals, zucchini “pasta” with seasonal veggies and mascarpone cheese. If I had to list the top 10 dishes I make, this meal would very likely be on it. Not only is it absolutely delicious, it also speaks so much to how I see food. It uses local seasonal ingredients I bought at the farmers market and it makes the veggies the star of the show. I limit meat consumption not only by eating plenty of vegetarian meals, but also by making dishes where the meat is the guest star and not the main act. This whole recipe uses only 1/4 pound of pancetta for the whole dish (and certainly could be made totally vegetarian). This recipe also represents so much of what I believe about healthy living and eating. Now, take a deep breath and put that frozen “Jenny Craig monosodiumdycalcitride glucolaurelatepathos may contain rat poison, but it only has 2 grams of fat and 100 calories” meal down and listen to me; I used 1/4 pound of pancetta and 2 oz of mascarpone. I used very small amounts of two fairly fatty foods to add a ton of flavor. So I used a little and got a lot, got it? Plus this meal was fresh, natural and had a ton of nutrients from all the vegetables and I’ll take a little real fat over fat-free chemicals any day! 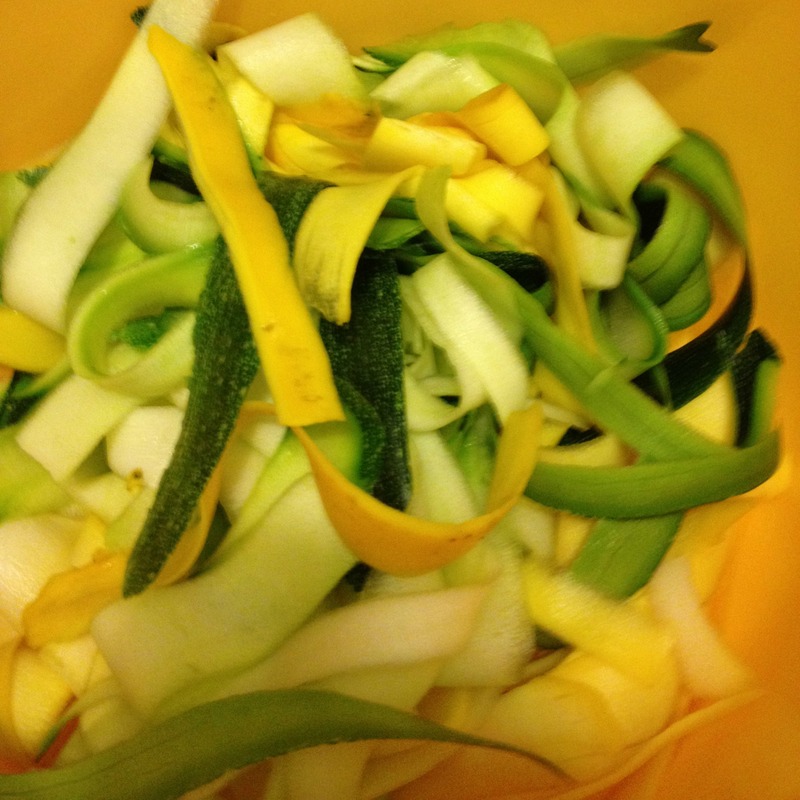 Using a vegetable peeler make thin strips of zucchini, working down all sides until you get to the seeds. Set ribbons aside and cube up the inside, seeded part of the zucchini (You could just discard them, but I think that’s a waste of food and they’re delicious). Set aside. 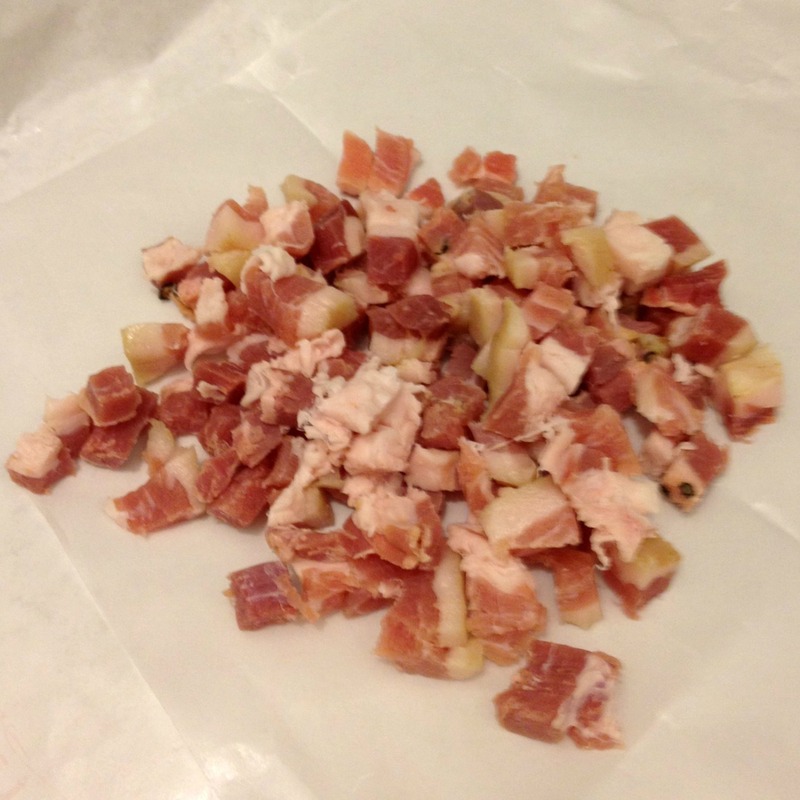 Cut pancetta in small cubes, then in large saute pan cook over medium high meat until pancetta is crisp and brown. Using slotted spoon remove pancetta to a plate covered with paper towels. Drain then transfer to a serving bowl. Do not discard the fat from the pan, if there is too much fat pour some out to leave you with a couple of tablespoons in the pan. If you’re keeping the recipe vegetarian skip and heat a couple of tablespoons of olive oil for the next step. Meanwhile bring a large pot of water to boil. 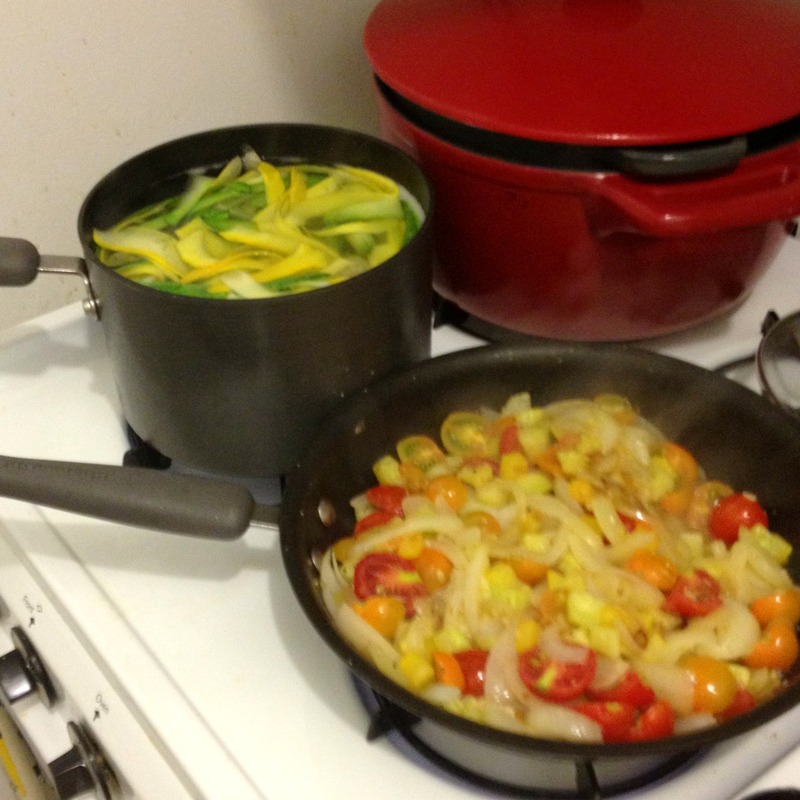 When water is boiling add salt and zucchini ribbons and cooks for about 5 minutes until ribbons are tender. Strain through colander then set aside in serving bowl with pancetta. Lower the heat to medium and add onions and cubed zucchini to the pancetta grease with some salt and pepper to taste (go light on the salt since pancetta is salty, if you’re not using pancetta you can be a little more liberal) and cook, stirring occasionally until the vegetables have softened, 5-7 minutes. Add garlic and cook, stirring occasionally for 2-3 more minutes. Stir in cherry tomatoes and cook until tomatoes just begin to soften and lose their shape a bit, about 3-4 minutes. You don’t want the tomatoes to turn to mush. Gently toss the sautéed veggie mixture into the “pasta” and pancetta. Stir in the basil. Gently fold in the mascarpone until it’s all melted and the veggies are coated. Serve with an extra dollop of mascarpone and more basil on top. I think this recipe might look prettier if you didn’t mix the sauce into the ribbons in a big serving bowl and instead put the “pasta” in your individual bowl and then piled the veggie/mascarpone mixture on top. I put everything in one bowl because space is at a premium in my apartment. If you keep this vegetarian I might try adding some parmesan cheese for a salty kick. Or if you find mascarpone too bland without the pancetta, you could replace it with creme fraiche, which is a totally different flavor, but adds a great tang. This entry was posted in Uncategorized and tagged Pork, Recipes, Seasonal, Vegetarian. ← From a Concerned Food Blogger to Kim Kardashian: Please Help! Wow, I’m in complete agreement with Erin! It looks amazingly delicious. What an inventive recipe. I LOVE marscapone cheese.